Yesterday’s big announcement that Phil Lord and ChrisMiller, the duo behind The Lego Movie and 21 JumpStreet, are making a movie about a young Han Solo movie is enough to keep Star Wars fans busy for a while, but that’s not all we’re going to get. 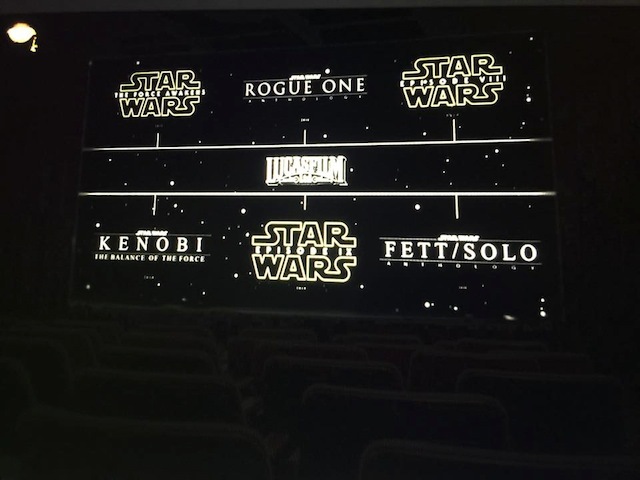 With San Diego Comic-Con this week, and Lucasfilm’s presence, we knew more was on the way, and now some has leaked out ahead of schedule, namely an image showing the entire upcoming Star Wars slate. This picture started making the rounds on Imgur. Apparently a worker at the convention center where Comic-Con goes down saw this and couldn’t resist snapping a quick photo. The first three aren’t such big news. We already knew about J.J. Abrams’ Star Wars: The Force Awakens, Gareth Evans’ standalone anthology film Star Wars: Rogue One, and RianJohnson’s Star Wars: Episode VIII. From there we’re getting an Obi-Wan Kenobi movie, Kenobi: Balance of the Force, which is something that has been rumored for a while, but this is confirmation. Then there’s Star Wars: Episode IX, which we know that Johnson is going to write a treatment for and possibly direct. And then it looks like we’re getting Lord and Miller’s Fett/Solo. The timing is a little bit in question. When the Lord/Miller announcement came down, it arrived with the release date May 25, 2018. You can’t really tell if there are dates on this image—maybe they’re really small under the logos, but you can’t be sure—and if this is the order, we’re getting a lot more Star Wars way faster than we thought. Right now, The Force Awakens opens in December, Rogue One hits December of 2016, and Episode VIII is scheduled for May 26, 2017. But if this is the order (or at least the logical, left to right order you assume, it’s possible they’ve got some wacky pattern in mind, like left to right on the top row, down one, then right to left, but now I sound like a crazy person) holds, within a year, from May 26, 2017 to May 25, 2018, we’ll see four Star Wars movies. That’s insane, and the order has to be something different, but it really doesn’t matter because however you slice this, we’re getting a ton of Star Wars over the next few years. That doesn’t even take into account all of the books, shows, and comics, that are all official canon from this point on. I wonder what Lucasfilm has planned for Comic-Con this week? Maybe they’re going to announce Ewan McGregor is coming back as Obi-Wan. That would rule. Guess we’ll find out on Friday.